Write more often, with fewer words, and say more. 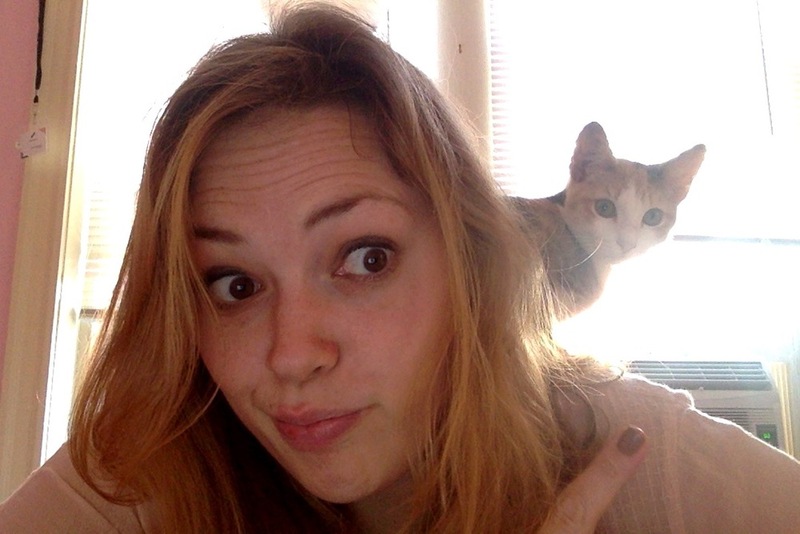 I get a little stir crazy when I work from home. Working from home is much more interesting with pets. Recently, I was laid up with a hip injury (What? I'm 31.) and worked from home for just 2 days. After a weekend doing freelance and volunteer work from home, I felt compelled to come at this the right way, so that I would have a better chance of keeping up with a tight schedule and lots of deliverables. I'd worked from home when I was at a startup last year, and know I had some pitfalls like distractions, eating too many snacks or never shutting my computer off and stepping away from work. The good news is, I was able to streamline things and may have actually gotten more solo work at home than I do at the office. Working from home cuts out much of the day-to-day office minutes I usually spend; communting is #1, also chatting, going to the coffee shop, getting lunch, running errands, hitting up the farmers market. I do try to make a little time for work pleasantries - each time I talk to someone new that day, asking how they are, chatting briefly about non-work. Part of the joy of working from home is flexibility - being able to run an errand or head to a doctor's appointment at the drop of a hat. Or being able to wake up at 8:15 and work in your PJs for 2 hours. But it's all about achieving a balance between flexibility and structure that will help you shine. A few things I gleaned from working from home this time, and over the past 8 years. 1. Don't check all of your email all of the time. Make time for it throughout the day. Don't react each time one comes in. 2. Keep calls short and sweet. Unless you're brainstorming. No one wants to be on the phone for 30 minutes at a time each time you talk. 3. Sit in a comfy chair. Get up and walk (at least around the room) a few times an hour. 4. Headphones are great for conference calls, but only if they work. Keep a spare pair of headphones around for instances that they fail. 5. Hydrate!! If you're drinking tons of water, you'll be less likely to snack on all of the delicious things in your kitchen. 7. Be available. Relentlessly available. If you're not at your computer because you're making cocoa or running an errand, check in on all channels when you return. 9. Keep your workspace clean. Nothing worse than feeling like your home life is encroaching on your work life. Piles of papers and yesterday's mail shouldn't take prime real estate in your desk area. 10. Pets love when you're home. They just love it. I'd love to know about your experience working from home. Do you jive on a particular playlist? Do you work on your kitchen floor? How do you make yourself the most productive version of yourself at home? Four years ago today, I started my job at a new company in Philadelphia. I had just moved to the area from my parents' house in Queensbury and was on my own for the first time since college, living in a new place, knowing barely anyone, with no clear idea what I was going to be doing or even how to survive successfully in the real world. I was barely 25, eager to employ my skills from college but I wasn't altogether sure what those were. I knew I was smart, but I didn't know just how to apply myself. I took a chance coming here, starting this new job, venturing out into the world. I took a chance, but it turned out to be a good one. The company, back then, was called FD kinesis. We were a small marketing firm that had been acquired by a larger parent company, but the spirit of Kinesis Marketing still held strong. The five founders, all with unique personalities and charm, all had their specialties and had hired people to manage accounts and run different facets of the business. It was interesting to me to learn everyone's style and skills. I loved the days when we would all gather for a meeting or a party in New Jersey or Philadelphia, and I'd get to mingle with my colleagues from Morristown and New York. I felt so cosmopolitan, walking down to Old City for happy hours where mussels were served. I had never even had a mussel before I set foot in Philly. My eyes were being opened up to new parts of the world. My job came with challenges. I had work and lots of it. And instead of answering to a boss, or several layers of bosses when work was piling up, I was answering directly to clients. These were very demanding clients, many of them, who all wanted things the next day or the same day, all at once, none of them knowing about the others. At my previous job, I had learned to manage my time in chunks, going methodically, quickly and accurately through monotonous work. But now, I was trying to get a grasp on new work, learn how to do it, communicate and build relationships with dozens of clients, attend meetings, as well as turn things around quickly and accurately. It was a lot to handle. I once reached out to my coworker across the room over IM, asking "What do you do when everyone wants things from you at once?" He suggested saying no. I hadn't even considered it. Over time, I learned to temper my feelings of stress and manage my time and the clients. I found I enjoyed balancing all the different moving parts. I got good at it. I may have gotten too good at it. Because somewhere down the line, I got bored. My boss had changed a few times since I had come to the company, first FD kinesis, then FD, now FTI Consulting. And the latest boss suggested I take a look around me at what others were doing. Look into new avenues at the company. Talk to the people around me and find something I could be interested in pursuing as well or instead as a next career move. I looked into information architecture, HTML, social media and then...I found writing. The creative team at FTI is pretty robust, but full of mostly designers. There are two writers, one of them a managing director, who when I expressed interest - excitement, delight, ecstatic joy - welcomed me with open arms. It had been almost three and a half years since I began my journey at FTI, but I finally felt like I found the reason I'm here. I had spent the past years building my skills, my confidence and my finesse with clients and colleagues and now was my chance to shine. It's been over six months since I was welcomed by the creative team. I still do the job I was hired to do four years ago. But I am taking steps in a new direction. I'm writing each and every day, honing my editing skills, my eye for detail and my ear my voice and tone. I feel like I've learned so much even in the short time I've been doing this. It makes me wonder what I could learn in a year. Or three years. My time in Philadelphia and at FTI has only been a small part of my life so far, and I've got a long way to go. But what I've learned since I began here four years ago has amounted to the great things that can be achieved when you take risks and work hard. Don't ever be afraid of the unknown. It's where your future is waiting. With change, always comes a little pain. Even with change for the better, there are always questions and uncertainty and upsets within the system. Recently at work, we've been going through what has been called a time of restructuring. I've had many interesting conversations with people in different parts of the company to get their take on what this means, and really, from all angles, I get a resounding answer of "we don't know yet." This "yet" tacked on gives it a sense of temporary being, that we don't know what exactly the future will be, but we'll get there together, and once we're there, we'll know! It's tough to be at a company for a long period of time and be completely content. Especially a company that has gone through as many changes as mine has. It was acquired back in 2008 when it was a small marketing firm, and has since grown and changed and evolved into the creative arm of a very large, very robust consulting company that seems to want it to do one thing, when it clearly wants to do quite another. Some people seem on board with the changes, but these people appear to be already doing the work that aligns with what the new structure needs most. I hesitate to say which side of the fence I'm on because of a few things. I have a job. I have a secure job, serving two clients, in two different capacities. One of these is a writing job, which I'm very happy with, and my job isn't going anywhere anytime soon. I am lucky and grateful to have my job. The second thing is that I have the opportunity for growth. I don't know how or when the next bout of growth will happen, but it's happened already in the past year by leaps and bounds, and I can only see myself continuing to grow and develop here as time goes on. Lastly, I work with some of the best people I know. And I have no doubt that I will be taken care of no matter what happens. So, let's restructure. Let's see where it takes us. To infinity and beyond. I'm ready to ride this thing out for the next year and see where we all end up. You've stumbled upon some of my not-for-work works. These are the things I write when I'm not brainstorming for clients or penning copy for the web (or sometimes, even when I am). Each is a part of me, but none sums up my whole. That'll be the autobiography.